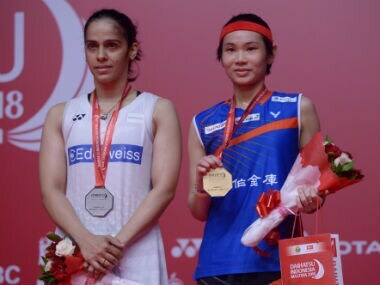 Jakarta: Saina Nehwal suffered her seventh straight defeat to World No 1 and old nemesis Tai Tzu Ying, going down in the summit clash of the $350,000 Indonesia Masters on Sunday. Playing the final of an international tournament after a year, Saina, who is coming back from an ankle injury, failed to lift the veil of deception put by Tai Tzu and went down 9-21 13-21 in 27 minutes in a completely lopsided final. Tai Tzu has now defeated the former World No 1 nine times in their last 10 meetings. Saina had enjoyed early success against the Taiwanese till 2011 but the Indian has beaten her only once at the 2013 Swiss Open ever since. The World No 12 was no match for Tai Tzu, who toyed with Saina with her supreme agility and deceptive returns. The Indian also committed too many unforced errors. Tai Tzu looked very sharp from the word go and jumped to a 10-2 lead early on. Saina grabbed a point after dominating a rally but the Taiwan player entered the break with a comfortable 11-3 lead. Saina tried to make a comeback and gathered a few points after the break but couldn't keep Tai Tzu away. At 7-12, the duo engaged in an epic 43-shot rally which ended with Saina hitting out. She then lost a video referral to concede another point as Tai Tzu reached 14-7. Both of them erred with their returns and went wide as the score read 16-8. Saina again erred with her smash and then a magical return from the back of the court by Tai Tzu took her to 18-9. She then produced a tight net return to move to game point and unleashed a backhand return which Saina couldn't negotiate to seal the opening game. In the second game, Tai Tzu continued to dominate the proceedings with her deceptive returns to lead 4-0. She produced some awkward angles from difficult positions and showed such immaculate control to leave Saina completely flabbergasted. Saina grabbed points when the Taiwanese shuttler missed the line with her returns to move to 4-9. Another rally ensued and Saina tried to dictate the pace but went long again. Another weak return went wide for Saina, giving Tai Tzu an advantage of 11-5 at the break. Saina tried to high serve next and it worked as Tai Tzu hit long. But the Indian made a service error and also hit out again to allow her opponent to lead 16-9. Saina then produced a superb cross-court return but two long shots by her handed 10 match points to Tai Tzu. The Indian saved two but eventually, a long shot helped Tai Tzu to walk away with the crown.